Season the chicken with salt & pepper to taste. Heat oil and butter in a skillet; fry the chicken until browned all over. Remove the chicken from the skillet. Add the onion & garlic to the skillet & cook gently until just beginning to soften. Add the bell peppers to the skillet with the mushrooms & continue to cook for a few minutes longer, stirring occasionally. Add the Italian seasoning. Add the tomatoes & plenty of seasoning to the skillet & then transfer the vegetable mixture to an oven safe casserole. Place the chicken on the bed of vegetables. Add the wine to the skillet & bring to a boil. Pour the wine over the chicken & cover the casserole. Cook in a preheated oven at 350°F. for 50 minutes. When ready to serve, add cream & serve over pasta. Combine cucumbers, lemon juice, salt, paprika, tarragon, & parsley in blender for 3 minutes. Add sour cream to the mixture. Mix well; refrigerate for 20 minutes or until chilled. 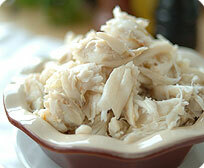 Place lump crab meat in cocktail dishes & chill until ready to serve, then pour dressing over crab dishes. Chef’s Note: This recipe was the First Place winner in the 1971 National Hard Crab Derby in Crisfield, MD. I have to tell you, I LOVE me some Pocky. Luckily I live in a really diverse area where they’re actually sold at grocery stores like Lucky and Safeway. When I was younger the only place I could get things like Pocky and Yan-Yan was a little corner store near my house run by some nice Phillipino people. Otherwise I would have had to go into Chinatown in Oakland. Kickin’ it old school Food Askew, recipes were shared and inspiration occurred! 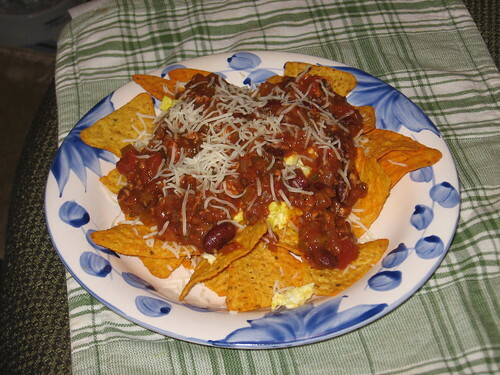 Our chef for this recipe, randilicious, was inspired by SweetIrony!’s Huevos Doritos and his overflowing amount of leftover chili and voila! Decadent Huevos Doritos were born! Scramble together the 2 whole eggs & 1 egg white. Spread chips onto a plate. Place scrambled eggs over the top of the Doritos. Add shredded cheddar over top, to taste. Chef’s Note: I actually used a slightly healthier alternative called Cactus Joe 100% Stone Ground Corn Nacho Cheese chips instead of Doritos. Brown the ground turkey with ½ the onion, ½ the garlic (2 cloves), & 1 tbsp chili powder. Set aside. In a large skillet over medium heat, combine remainder of onion, garlic, & tomato paste. Cover & cook for 5 minutes. Stir in butter until melted. Stir in flour, oregano, cumin, red pepper, chili powder, tomatoes, beef, & Jack Daniels. Cook uncovered for 8 minutes, stirring occasionally. Stir in the beans & cook for another 4 minutes, stirring occasionally. Salt, pepper, & other spices to taste. Simmer covered at low heat until serving time.